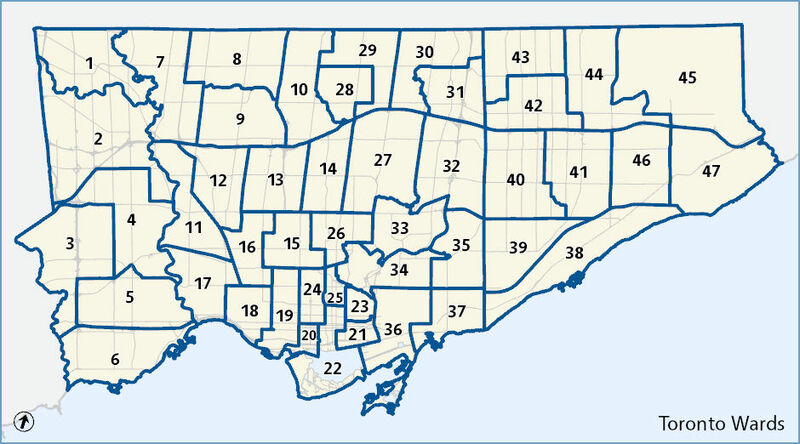 Before Bill 5, Better Local Government Act came into force and established the City’s 25 Wards, Toronto City Council had approved a new 47-Ward Model based on the Toronto Ward Boundary Review. The census data and maps listed below are for the 47-Ward Model, which was not implemented. Based on Bill 5, the 2018 municipal election for the 2018-2022 term was conducted using a 25-Ward Model. Ward Profiles are available for the 25 Wards (2018-2022 term of City Council) and former 44 Wards (2014-2018 term of City Council). Ward Profiles contain information from Statistics Canada Census of Population, which is conducted every five years. The 2016 Ward Profiles provide demographic information on population by age, households and dwelling types, families, language group, household tenure and period of construction; immigration, mobility, ethnic origin and visible minorities; education and labour force; income and shelter cost (Revised July 7, 2018). Learn more about the Census data.